Making An Camas Mòr look and feel part of Rothiemurchus. Local families, school students, The Cairngorms Business Partnership, website and facebook users are working with Gehl Architects to create Design Guidelines that will enable a range of different builders and designers to create a place that is uniquely characteristic of Rothiemurchus, is attractive and which meets the community’s practical needs. An Camas Mòr will set out the framework for building and then work with a range of building firms and self-builders who all work within The Community’s Design Guidelines to gradually build the plan over 30 – 50 years, as opposed to selling the whole site off to a volume house-builder (as is normally the case). This gives the local community a greater say in what will be built and makes it easier for self-builders, smaller firms or community development vehicles to build on a site the size of An Camas Mòr, meeting demand at about 30 – 50 homes a year. This way of working has recently been revived successfully on a bigger site at Tornagrain near Inverness Airport and Chapleton of Elsick outside Aberdeen. The Design Guide will clarify, using images, what the streets and building facades will look like by defining materials and details such as roof pitches, colours, porches and windows. These should reflect the forest landscape, by using timber for example, whilst achieving excellence in contemporary design. It should give the community, landowners and investors greater confidence in what will be built and lead to a greater sense of place with higher values in the long-term. The Design Guide should enable small-scale builders, self-builders and business owners to create ‘variety within a pattern', lending the community diversity and richness that a volume house builder could not match. As far as is practical, all buildings should have some unique details to give them some individuality, which could be an integral part of the original building or personalised by the occupants. This will mean that people can live and work in a place which looks and feels part of Rothiemurchus, rather than a housing estate which feels like it could be anywhere or where all the houses look the same. An Camas Mòr are planning to work with two or three family-run, medium-sized building firms alongside self-builders. These firms are preferred because they are able to build specially designed homes for An Camas Mòr, whilst having the capacity to meet housing need and demand. These firms have a proven track record of making two attractive places in the North of Scotland, delivered to Detailed Design Guidelines, at a high quality. This includes another community in The Highlands which, like An Camas Mor, was among the 11 projects selected by the Scottish Government as exemplars of the Scottish Sustainable Communities Initiative. Design Guidelines for Coylum Road that specify plot locations, storey height and widths, materials and details based on the Victorian ‘vernacular’, with freedom of expression to the rear, were used at Rothiemurchus to create a design that is both popular and value-enhancing. 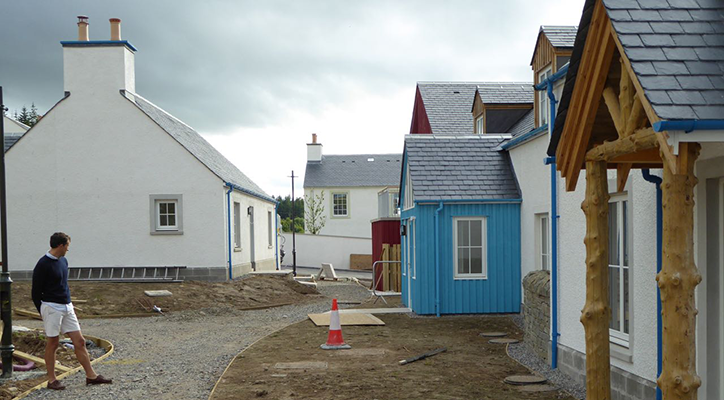 The Design Guidelines for An Camas Mòr will differ from Coylum Road in that the homes will be designed to be more affordable, with ‘joined-up’ housing built on the edge of the plots. 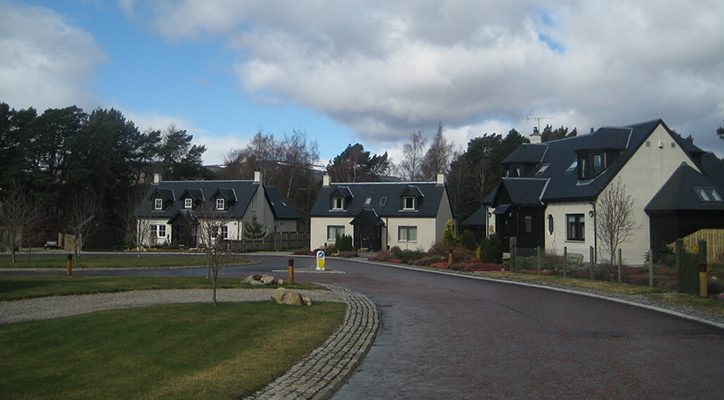 Placemaking by small firms or self-builders, on a plot by plot basis, within a unifying design set down by the estate’s surveyor or architect is historically the way most Scottish ‘New Towns’ (such as Grantown and Tomintoul) were built in the Georgian and Victorian era and is closer to the way most places on the continent are built now.